It is certainly no secret how much I love soup and as much as I love it, my husband loves it even more. He would happily eat soup 365 days out of the year, but its a little harder for me to get excited about whipping up a batch of soup when its in the middle of summer. However, I do try to make a soup once every other week in the summertime because we do love soup and its also a great way to get a ton of veggies into our diets...this recipe isn't so veggie-centric though! I love pasta in soups, but hate when I have it for leftovers and it just soaks up all the broth and gets super-soggy. If you plan to have leftovers, just cook the noodles separately and add them into each bowl individually so you don't end up with a soggy noodle soup for leftovers. 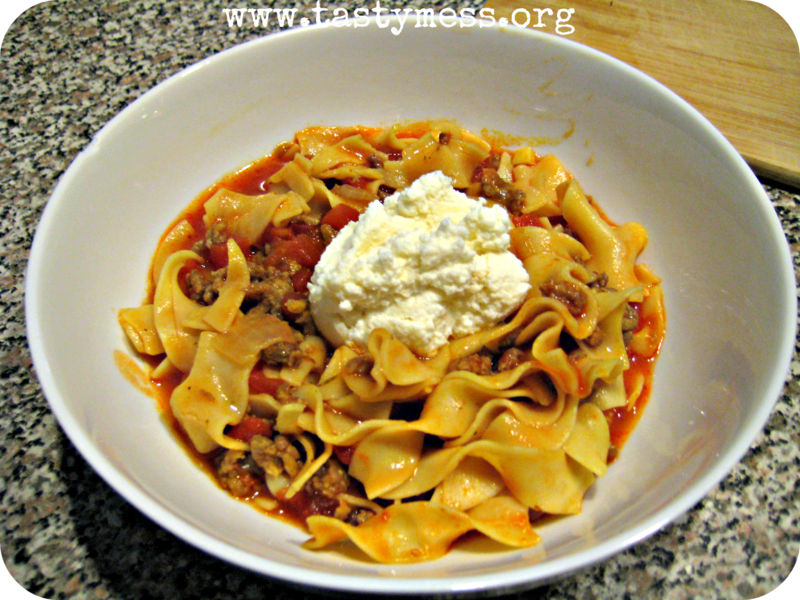 Topping the soup with a dollop of ricotta cheese has to be my favorite part, mixing it in and enjoying the creaminess it brought to the bowl was kind of addicting...I definitely had two bowls! What are some of your favorite types of soup? Are you too warm this time of year to even think of cooking soup, or is it still a regular feature on your stovetop? Spray a large dutch oven-style pot with nonstick spray and heat to medium. Add in crumbled sausage, onions, and garlic. Sprinkle generously with salt and pepper. Cook well until the sausage is browned and the onions are transparent, about 5-10 minutes. Add in the Italian seasoning, red pepper flakes, and tomato paste stir well, continue cooking 3-4 minutes until the tomato paste turns a rusty brown color. Add diced tomatoes, bay leaf and broth. Stir and bring to boil over high heat. Cover and reduce heat to a simmer for 30 minutes. If you plan on having leftovers, don’t add the noodles at this point. Cook them in a separate pot and just add the amount you like to each bowl before serving. If you don’t plan on having leftovers (this serves 4-6), go ahead and add in the noodles, stirring occasionally, until tender (about 8-10 minutes). Mix together the ricotta, Parmesan and a sprinkle of salt and pepper in a small bowl. Right before serving add a generous dollop of the cheese mixture to each bowl of soup and serve.